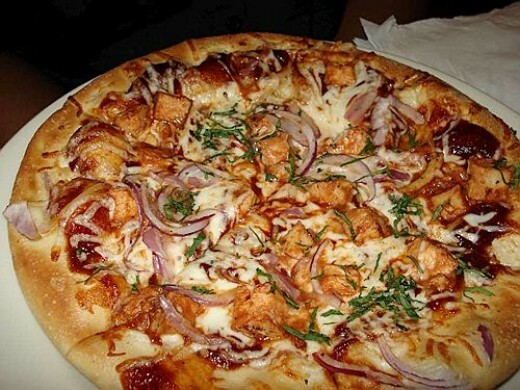 The California Pizza Kitchen Restaurant created the BBQ chicken pizza craze. They also have a lot of other unique pizza on their menu. This page will show you an easy way to make BBQ chicken pizza using prepared pizza dough. Read on to find out how simple it is to make this restaurant copycat recipe at home with limited cooking skills. I've never had much luck at making homemade pizza dough so for this recipe I suggest using a Boboli pre-made shell from the grocery store it will guarantee a perfect crust every time. According to the California Pizza Kitchen website this pizza was introduced in 1985 at their first restaurant in Beverly Hills, California. They list the ingredients as barbecue sauce, smoked Goudacheese, Mozzarella cheese, BBQ chicken, sliced red onions and cilantro. The recipe below makes one whole pizza. To make the Chicken: In a large frying pan, heat olive oil on medium high heat.Add chicken pieces and cook until done (about 6 minutes) Coat chicken with 2 Tbsp BBQ sauce. Chile in the refrigerator. 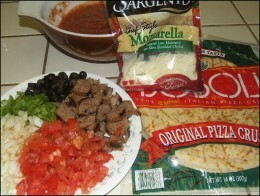 To make the Pizza: Spread 1/2 cup BBQ sauce over the top. Leave 1/2 in around the edges. Add your chicken. Add the cheeses. Put onion rings on top. Bake in a 425 degree oven for 10-15 minutes. Garnish with fresh cilantro to taste.Let the pizza sit for about 5 minutes before slicing to help the cheese set.